Ah, the return to normalcy after the long, dull, concert drought that is the Holiday Season. It was great to get back to the comfortable grime of Lenny's. 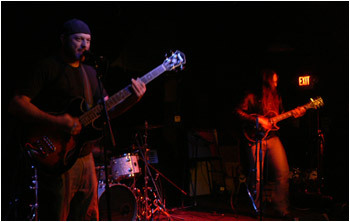 The band was a three-piece called Shadowboxer who made a loud, rollicking hard rock. The drummer had a heavy hand, really pummeling his kit. The bassist/vocalist had impressive muttonchops, a real smooth playing style, and bellowed as if the muttonchops gave him the powers of Lemmy from Motorhead. The rhythm section was very tight. I think these two have been playing together for a while. 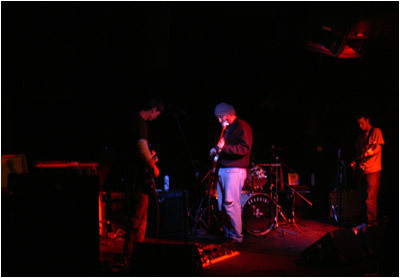 Shadowboxer play songs that follow the Classic Rock Format, meaning that there are guitar solos. Or, rather, parts where the rhythm holds a steady beat and the guitarist arpeggios. 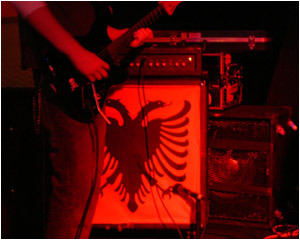 The guitarist tried his best to sound like Eddie Van Halen, but just didn't quite hit it. I don't know if it was that he wasn't mixed loud enough (he was actually mixed the same as the bass and drums, not over them), or if it was just a bad night for him, but i found the solos to be the low point of their performance. 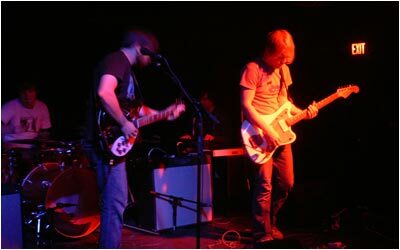 As to the high point -- for their last song they started a fast-paced tune with a rolling bass line and the guitar making sparse chords over top. When the vocals started, something seemed ... familiar. And then i realized it -- somehow Shadowboxer has managed to turn Joy Division's Isolation into a happy tune. The pace and the chording that was going on was positively joyful! How very odd. Making a Joy Division song sound happy means that you are doing it wrong. Overall, i was not that impressed with Shadowboxer. I have seen worse bands, though. Up next was the act we had come out to see: Graboids. Tonight marks the third time i have seen this Richmond-based post-rock act, and i have enjoyed their shows and records tremendously. Graboids take the standard post-rock a la Mogwai, Explosions in the Sky, etc., etc., and ratchet up the Heavy Metal Quotient just a bit. They are not the most productive band, though -- this is the first time they have played Atlanta since the release of their last record, almost a year ago. Tonight they sounded slower, and slightly more melodic than usual. That is to say, this was the least Heavy Metal i had seen Graboids perform. They sounded more like all of the other post-rock bands to be honest. 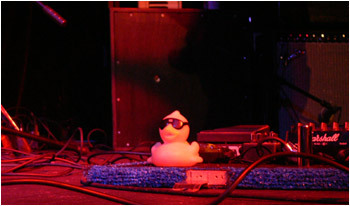 ...while the stage left pedals are guarded by The Duckie. That's okay -- it has been a while since i have seen a good post-rock show, so it was welcomed. And even at their most generic, they still do it well. They performed 5 songs in 45 minutes, all of them off of their latest record. 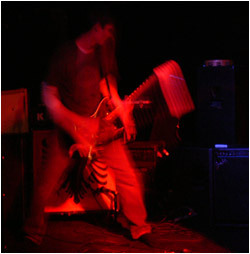 Especially noteworthy was a head-thrashing performance of Tremolo, where the guitarists really got into it. That was the closest they got to channeling Black Sabbath, unfortunately. The previous times i had seen them, and on their records, there are many real thrash it out moments, but there really weren't any tonight. Still, a good performance and i will go see them the next time they manage to make it down to Atlanta. As we were sitting there waiting for Sleep Therapy to take the stage, a guy set up on the floor, aka, the Side Stage at Lenny's. He introduced himself as Chris Strawn, and he had a guitar, a couple of distortion pedals, a mic, and an old component tape deck for churning out drum loops. 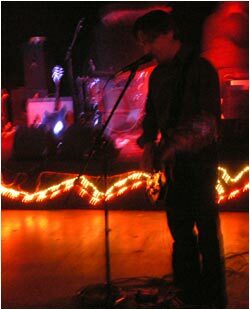 He played a dirty, distorted blues rock that is, i have to admit, totally over done these days. I mean, really -- from The White Stripes to Black Rebel Motorcycle Club, there are dozens of acts doing this exact same thing. And you gotta act crazy when you do it, right? So Strawn flailed around, screamed, and urged people to dance. To be honest, i really am not impressed with this style of music. I know that people really get into, but i could care less. So i sat there, slowly realizing how tired i was, and how long of a work week it had been... Strawn was a real killjoy. Chris Strawn kills the fun. He played about 30 minutes, and then thanked the crowd while explaining that what we had just witnessed was "an experiment" by the lead vocalist of Brass Castle. I applaud him for trying something different, but really Chris -- if you are going to try something new, why not try something that hasn't been done to death? Sleep Therapy have to concentrate on their guitars to stay awake. But it was after midnight, and it had been a long week, so we headed out. Still this was a decent start to the 2008 concert year.